I find that teaching writing is one of the hardest things to do. I know there are awesome teachers out there who excel at writing instruction – but wow, this is a struggle for me. Teaching writing is such an individualized type of instruction (especially in my class) and honestly, it is not even close to a favorite with my students. As always, I ask myself, how can I make this more engaging? I’ve found that varying our publishing tactics to be a key to writing engagement. Traditionally, publishing work results in a final copy being written on notebook paper or typed in Word. I do both of these things. However, we’ve explored a variety of other ways to publish this year. Most recently we worked on descriptive writing. The writing prompt was to write a solid two paragraph composition describing, in vivid detail, the student’s favorite food. The catch? No where in the writing could they actually tell me what the food was. I had to be able to figure it out from the description. The hook? 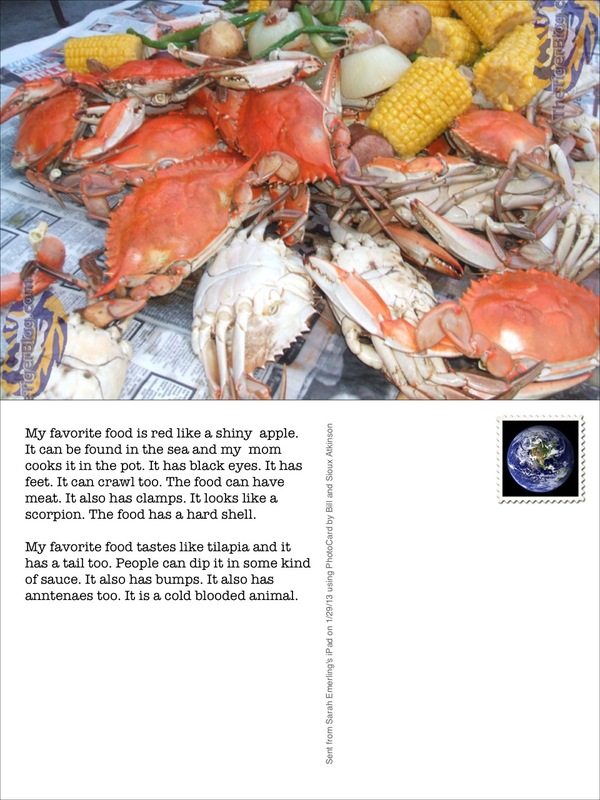 When students finished writing and editing their rough drafts, they would be publishing their work as a digital postcard. I think they wrote faster than I’ve ever seen them write in their lives! We used Bill Atkinson Photocard app on the iPads to publish. 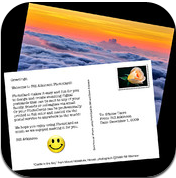 The app generates a digital postcard with an image on the top and your text at the bottom. 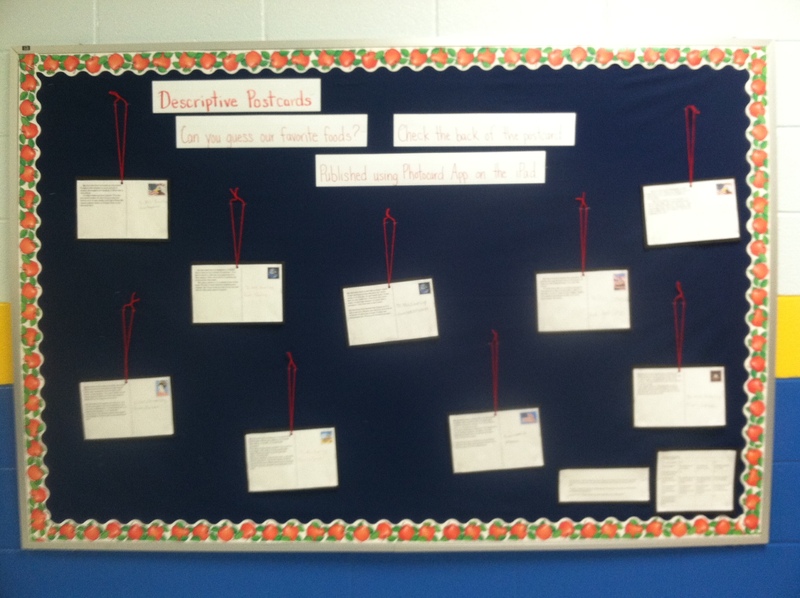 Students can even send the postcards via email to whomever they choose. The buttons are really easy to navigate and typing was easy to do. After typing and editing their final drafts, we did a safe search on the Internet for Creative Commons images to use as the photo part of their postcard. The final products were simply outstanding. In the end, I printed the postcards out and cut them apart so that the image was on one side and the text on the other. I strung them up with yarn and used them as an interactive bulletin board outside my room. 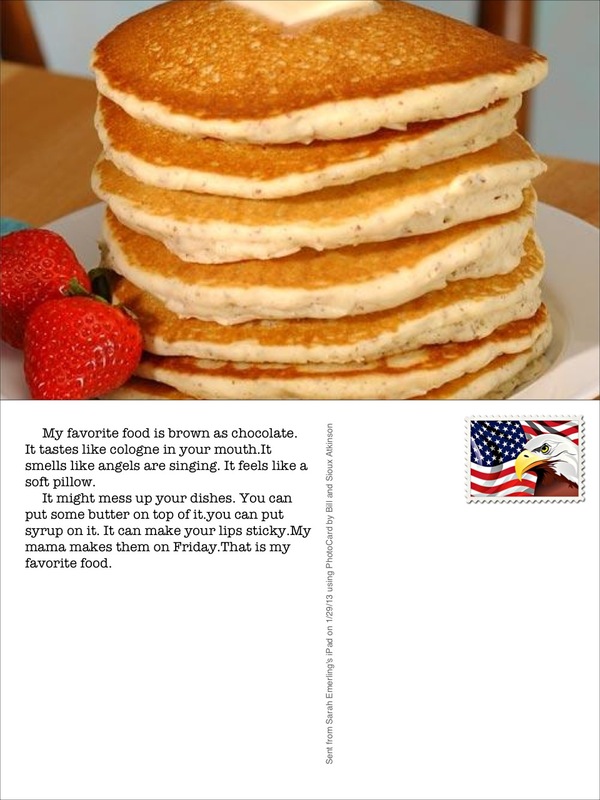 Viewers could read the descriptive writing and guess the favorite foods before flipping the postcard over to see if they were right. So this activity not only engaged the students, but also gave me this month’s bulletin board…excellent!